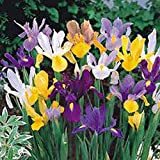 Reblooming Bearded German Irises provide a great color selection of Large Flowers that come back year after year with easy care. A great addition to any garden. 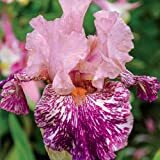 REBLOOMING Bearded Iris Eternal Bliss Fragrant Bearded Iris - 1 Large Rhizome - Fragrant! Gorgeous Blooms 24-36" - Deliciously Fragrant! Zones:Spring flowering perennials in zones 3-11. Also reblooms late summer/fall in zones 5-10. Very Light Pale Violet That is Nearly White - Attracts Hummingbirds and Butterflies! Well drained preferred. Quite tolerant of a wide range of soils including Clay Soil;Loamy Soil;Sandy Soil. 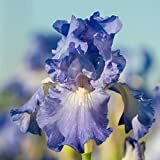 Gorgeous Blooms 24-36" - Fragrant! Blooms Are a Soft Blue Purple With White Beards and Accents - Deer Resistant!